It all started with a spell. Arran Conall lives with the consequences of his foolishness daily, his mistakes guiding him into darkness. He had no way to know that his beloved would fall prey to the ancient magic that awaited Blaire on the day he sent her away to marry his brother. Now, the only woman to ever give pause to his philandering ways lives centuries ahead of him, out of reach while still holding on to his heart. Now, he must try to live a life without her and marries another to save the lass from a greedy suitor who only wants to lay title to her father's territory. His love for Blaire haunts him. With every breath, he prays only one thing- that she will be able to feel his love for her across the chasms of time. Born in the 17th century, Blaire MacChristy lives each day trying to adjust to the challenges of modern-day life. Magic brought her here, but heartbreak keeps her from using the magic to travel back to her home. When visitors from her past arrive asking her to return to the life she knew before, Blaire takes a chance on love. Once home, she is shocked to learn that the man she loves has married another. Will fate find a way to mend their broken hearts by bringing them together once again? Even if it does, will they be able to stop the darkness that is coming for them both? I enjoyed this second book in the series just as much as the first. The story is light, fun, and easy to follow. It was predictable at times but it never took away from the likable characters and entertaining story. Narration was also very good. As good as book 1, just Adele's voice bugged me. Can not wait for de suite. I saw that only 4 books of the serie are in audio. 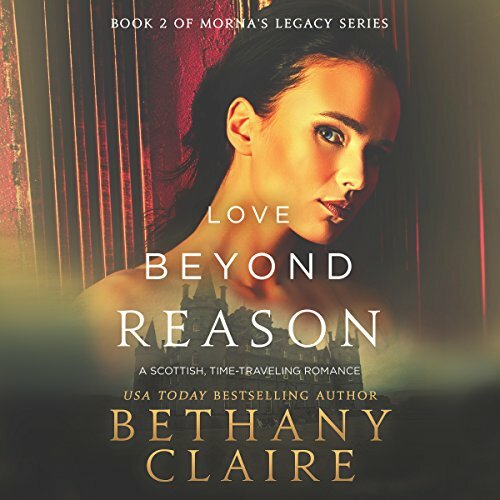 Would you listen to Love Beyond Reason: A Scottish, Time-Traveling Romance again? Why? YES!! I listened to the first book right before starting this one in order to brush up on the story again. And will listen to this one again when the next book comes out. This is a very enjoyable series. Mary is my most favorite character!! I enjoy all of the main characters but she is so feisty you can't help but love her. Hopefully she will get a book devoted just to her! She does a great job with consistency. I can always tell which characters are speaking by the accent she uses. It makes it very easy to follow along. Prepare yourself to fall in love. I would absolutely listen to this story again the narration was right on I have read this book before I am big fan of the author and I like that I can pick up where I am reading and listen while on the go. The characters. The author makes it feel like you are in the middle of the story and you have just met a pack of new friends. Her voice is low and smoky and her Scottish accent is right on gives the characters more life than just reading. A modern woman travels back in time to meet a hunky scott. There are some real tear-jerker moments in this book (don't want to give away spoilers) but I did cry more than one. Anytime Mary or Adele are involved there is a potential for laughs. I have read all the books in the series but listening to them has really provided an additional insight into the stories. Lily's narration with the accents adds a special flavor to the books and really enhances the experience. I rated this 5⭐️ The storyline was engaging and creative. The characters was strong, compelling and Fantastic. The dialogue was charismatic and heartwarming. I like when the reader is acting out each character. I would highly recommend this audio book. This is very entertaining. I'm excited to listen to the next book in this series. This book is a wonderful continuation of the authors first. The reader seemed to have a better grasp on the characters and was really able to make them come to life. I really admire the way the author can seamlessly move from writing her characters in Scotland centuries ago and then the next chapter she is writing in present day. I'm so excited for more of her books to be released! I have read all of the books in this series and when I heard this was going to be an audio book, I was super excited. The narrator brings the characters to life with the audio version of Love Beyond Reason. I couldn't put this down. I walk while listening to audio books and with this book I looked forward to my daily walk. Can't wait for next audible in series! The women aren't all weak and whiny. The men are interesting and have depth. I can hardly wait to meet each new character in the series.